The best opera companies are more than merely peddlers of arias. They strive to discover new slants on the art form, champion fresh talent and, perhaps most importantly, show the cultural leadership that ensures the longevity of opera as an alive and evolving medium. All these qualities ring true in Victorian Opera’s co-production with Circus Oz, Laughter and Tears, which not only offers an intriguing perspective on a familiar staple of the repertoire – Leoncavallo’s Pagliacci – but also achieves a remarkably successful synergy between two seemingly distant practices. The galvanising element bonding these strange bedfellows is commedia dell’arte, the colourful, often raucous and occasionally improvised ancient Italian street theatre. Commonly paired with Mascagni’s Cavalleria Rusticana, Leoncavallo’s darkly turbulent story – exploring the murderous backstage jealousies of a travelling commedia troupe – gets a newly devised companion in this production: a cherry-picked selection of Italian song from the Renaissance and Baroque periods. The bright, buoyant first half – the titular Laughter – is all musical joy and physical exuberance, featuring commedia dell’arte in its most traditional iteration. The choice of music comes from a who’s who of Italianate art song, including works by Vivaldi, Monteverdi, Gesualdo and Scarlatti, all given a contemporary facelift thanks to the inventive orchestrations of Victorian Opera’s artistic director, Richard Mills. A showcase of sorts for five of the best from Victorian Opera’s professional development program – Kate Amos, Daniel Carison, Michael Petruccelli, Michelle McCarthy and Shakira Tsindos – the barrelling pace and whip-smart intensity of this opening half is driven by five talented carnies from Circus Oz’s physical theatre ensemble, Dislocate. It’s the conscious emphasis on the innate differences between these practices that makes this production so cohesive. The circus artists are cast as mischievous and somewhat inept stagehands, whose well-meaning but often misplaced enthusiasm constantly threatens to derail the exasperated vocalists. 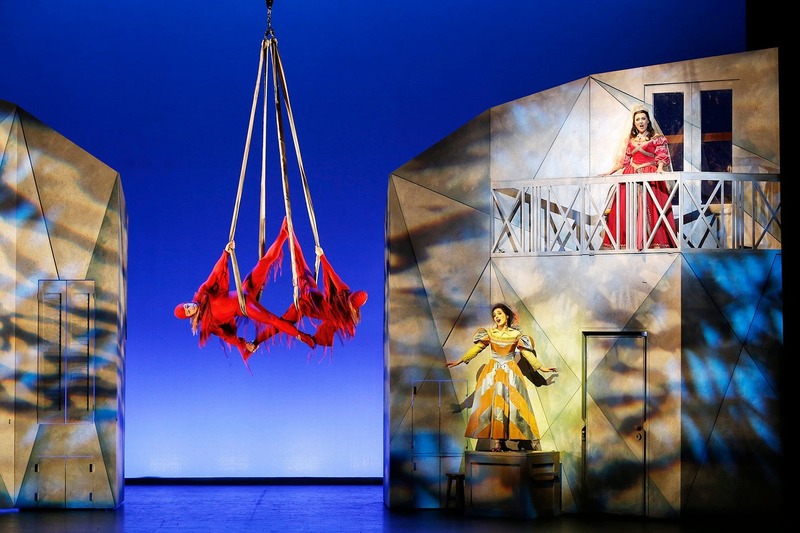 Julie Nelson’s simple but carefully conceived sets provide multiple levels, swinging doors and hidden hatches to keep the action dynamic, as bodies flip, flop and tumble across the stage. It’s pantomimic in the best possible way, with moments worthy of full-on belly laughs – but it’s also deceptively complex. The equilibrium between sincerity and silliness is expertly judged by director Emil Wolk to ensure the circus hijinks never undermine the calibre and execution of the music. Wolk’s greatest stroke of genius, however, is to refocus the storytelling through a specific historical lens. Set in a theatre in some provincial Italian location, the first half takes place just before the outbreak of the second world war. We return to the same theatre for the second half, as the dust settles following the war, while post-Mussolini Italy reels in the wake of fascism. Not only does this conceit offer a clever counterweight for this production’s comic-tragic hemispheres, but it reveals another vital polarity that imbues the melodrama of Pagliacci: innocence versus corruption. There could hardly be a more potent metaphor for humanity’s fall from grace than the unprecedented atrocities of the second world war; it suddenly becomes all too plausible that a society so recently gnarled by those horrors would resort to brutal violence to resolve its disputes. Although at times slightly overwhelmed by the open pit orchestra, Russian soprano Elvira Fatykhova brings both restraint and soaring power to her portrayal of Nedda, with the weightless lyricism of her floated top register well worth the occasional imbalance. Rosario La Spina as Canio is passionately strident, offering a magnificent Vesti la Giubba – although his performance may benefit from a greater tonal variety. Fabio Capitanucci is a sensitive and superbly acted Silvio. But the most impressive account of the night comes from James Clayton as the rejected lover and villain, Tonio. As the architect of Nedda and Silvio’s undoing, Clayton’s Tonio is unflinchingly brutal. The confronting edge of sexual violence to his performance might have seemed unnecessarily gratuitous in a more traditional context – but given the postwar setting, this unsentimental characterisation is an ideal anchor for Pagliacci’s tragic outcome. First published 15 Aug 2016, for The Guardian.